While Babar Azam has been taking huge strides and making headlines as a batsman, Hasan Ali,also in his early twenties, has been making waves for Pakistan as a bowler. 23-year old Hasan Ali has been exceptional with the white ball in the 15 ODIs he has played for Pakistan. He has been a bit on the expensive side with an economy rate of 5.92, but he has picked up wickets in heaps and he has picked them fast. Last night against the West Indies, he picked up his second 5 wicket haul in ODIs taking his tally to 28 wickets in only 15 ODIs. He has bowled a mere 120 odd overs for these wickets, which basically means that he has been picking up a wicket every 4 overs or so. In only 15 ODIs, Hasan has achieved the best ever strike rate for a pace bowler for Pakistan in ODIs - 26.4; i.e. a wicket every four and a half overs. Like Babar, he too has a long way to go to be considered in the same league as Pakistan's best, however his start has been quite amazing. He has already picked up two 5 wicket hauls, half as many as Shoaib Akhtar did in his entire ODI career, and a third of what Wasim Akram achieved in 20 years. 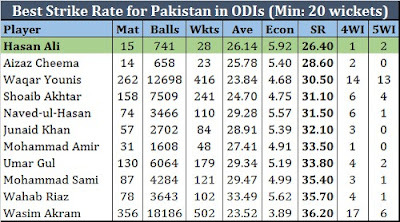 Among all international pace bowlers (excluding associate nations), Hasan's strike rate of 26.4 is 9th best, and he is the only Pakistani in the top 10 best strike rates in ODIs. 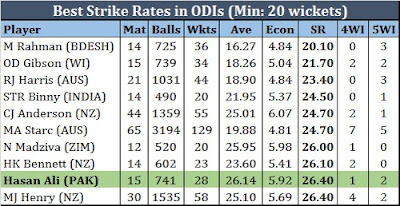 He has surpassed a number of quality bowlers to be make this list and it will take one hell of a sustained high level performance to maintain this strike rate. He has surprised many with his pace, and now he is surprising us all with his wicket taking skills. 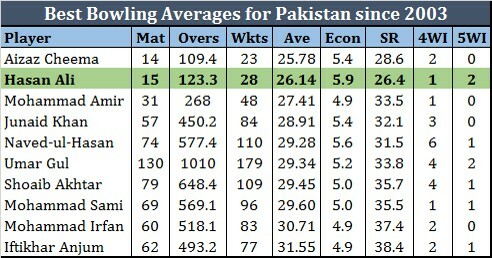 Pakistan has not found the same caliber of pace bowlers as Wasim Akram and Waqar Younis. Shoaib Akhtar promised much, but injuries never left him. Mohammad Asif could have reached the same league, but his vices got the best of him. Mohammad Aamer made the world take notice with his scintillating first year in international cricket, but he does not look like the bowler he did in 2010. It has been 14 years now since Wasim and Waqar last played for Pakistan. In these 14 years, Pakistan has fielded a number of pace bowlers, with only a handful that made a lasting impression. Hasan Ali is one of them. In his short career he has shown immense wicket taking ability, which has resulted in him having the second best bowing average for Pakistan since the retirement of Wasim Akram and Waqar Younis. You would have never guessed that Aizaz Cheema would be at the top of this list! Hasan Ali is not in the same league as the two Ws, nor is he a special talent like Asif or Aamer. But he is capable of producing fiery spells. 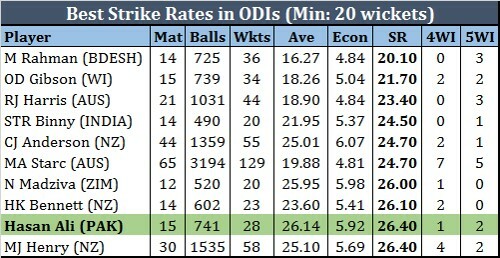 surprising batsmen, and picking up wickets quicker than most bowlers. He has the ability to constantly provide breakthroughs and is a major asset in limited overs format. Hasan Ali is also a special one who needs to be handled with care by the Pakistan team management. I believe a mistake has already been committed by including him in the test squad. I hope it is a one off, I hope he does not play any of the tests, and I hope the selectors can safeguard his future by telling him that they want him to focus on leading Pakistan's limited overs pace attacks.